The stand-alone Forgotten Realms novels that loosely tie together into the series called “The Sundering” seem to get better with each addition. I enjoyed this enough that I plan on going back to read Evans’ previous novels. Having mostly read Salvatore prior to this, I was a bit shocked at how more developed and complex the characters in this series are, and Evans’ voice is so unique and refreshing that at times I forgot I was reading a media-tie in, shared-universe genre novel. This is simply a good fantasy. 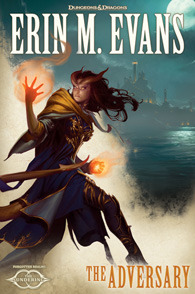 Evans writing is strong, often evoking a Medievalesque vocabulary and style of dialogue that places the story squarely in a high fantasy world without it seeming ridiculous. The style of her language is not artistic in a high literary sense, but it is fluid and unique, suiting this story well. Her plotting is also spot on, moving the story at a brisk pace without resorting to any tired troupe of merely moving heroes from one action sequence to another, overcoming each and every challenge in relative ease of a daily routine. Here victories are bittersweet, exacted with a price, and the most succulent bits of the story are not the physical clashes but the verbal and psychological battles. Getting into the novel was a bit slow to start due to my unfamiliarity with the characters, and Evans does place a wide variety of settings and characters (basically those from her first two books) into the complex intersections of the plot here. Things therefore do get a bit jumbled now and then, particularly in the second portion of the novel. Nonetheless this story stands far better as a stand-alone novel than others (say Salvatore’s entry). While “The Adversary” sets up future directions, the whole point of “The Sundering series”, a full story arc is still covered here, and in-depth knowledge of the previous books, while helpful, isn’t necessary. The next volume of the series is already in my queue to read, but I’ll be really surprised if any can top what Evans accomplishes here. This short biography covers the work of doctor John Snow in investigating outbreaks of cholera in England, a key event in the development of the science of epidemiology, tracing an illness back to its source and ultimate cause. Although Snow was no microbiologist, and it fell to Koch to eventually clearly identify the bacteria Vibrio cholera as the causative agent of the disease, Snow’s work laid the foundations for establishing a way to control cholera, namely to focus on water supplies rather than the prevailing view of the time, ‘bad air’. Challoner, an established writer of communicating science to a lay audience, particularly youth, writes this geared for older children and young adults, but for those unfamiliar with Snow’s work and epidemiology, it would be quick, highly readable primer on the topic. Challoner focuses on the cholera-related work of Snow, rather than writing an all-encompassing birth-to-death biography, though he does discuss tangentially Snow’s role as physician and pioneering anesthesiologist. 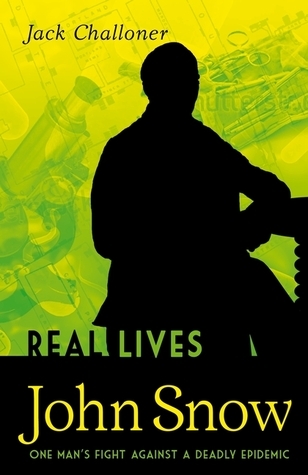 Despite focusing on this history of science and medicine, Challoner relates the story with descriptive warmth, including small details of everyday life at the time (mid-late 1800s) and conversationally, anecdotally through the thoughts of Snow and those he comes in contact with in his endeavors. Though fabricated in that retelling, the facts behind the story, the history, remain solidly accurate to my eye. Beyond introducing Snow’s accomplishments, this book in general outlines the scientific process of mystery, curiosity, research, refinement, and ultimate success, but with more work for others to carry on. In this sense it is a good general introduction of children to science in general. The only drawback to the book relates to who the audience may actually be. With text alone, it tends towards the dry and detail-laden, including some medical/scientific vocabulary, despite being related in a straight-forward way, more relatable perhaps to an adult. Yet, it is written in a short and succinct manner with phrases interspersed in the detail that seem geared towards the young. It thus seems most appropriate for a teen with a keen interest in science or medicine, or as a fine source for some school project or paper. I made it through this book faster than I ever expected given its topic and my own aversion to things involving economics. Detailing the attempted, and mostly failed attempts of the White House to direct negotiations over US economic policy regarding the debt limit and related matters, the book actually proceeds rapidly and easily, though also rather depressingly. Woodward tells the story with fine detail and coverage, including multiple points of view and accounts of events when they occur. While he occasionally passes a judgment, and gives his overall point of view conclusions at the close (within a new afterward for this addition), he relates the story in a relatively unbiased fashion. 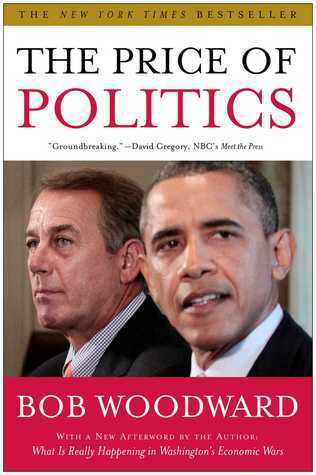 The book certainly informed me on the events leading to the sequester, the government shutdown, and the budget battles that still continue today, and it paints a picture where many tried to get something done, but all failed, largely due to inflexibility, overconfidence, and lack of trust. These sorts of ‘recent history’ books are important, because they give one a more complete look at a complex process, unlike the uninformative and intentionally spun outlets of media soundbites. In general, the events here are horrifying and frightening for many reasons, and show how ineffective the Obama administration has been at leading in this realm, and how dangerously ignorant and stubborn many of the Tea party-elected are. What is interesting is that while the Tea Party affiliated remain in the background of this history, never taking an active role in negotiations or attempts to actually govern, they exist in the background as the ultimate menace, and unspoken source of the Republican leadership’s repeated abandonment of talks at the slightest excuse and a rigid inflexibility on a host of issues. The limits of this book are perhaps obvious. It is focus on the events of a political process. There is very little information on the actual political issues, or the origin of party positions. These topics are touched on, but not analyzed or reviewed in any great detail as much as the specifics of events involved in trying to come up with legislation. It also avoids the question of how this process can be improved, or if the system in general is now failed and needs a complete overhaul. All of these are beyond the scope of the book though. Finally, the book reads as somewhat incomplete for it is just that. This history, the process of trying to deal with these issues politically, is still in motion as I write this. So by the end of the book, the story still isn’t quite over, an inherent problem with this sort of work. I count myself very fortunate to have discovered the work of Peter Watts through NetGalley. I don’t recall hearing of or reading this Canadian author before, but his writing is something that I know I will be returning to both for new works and reference back to these incredible stories. 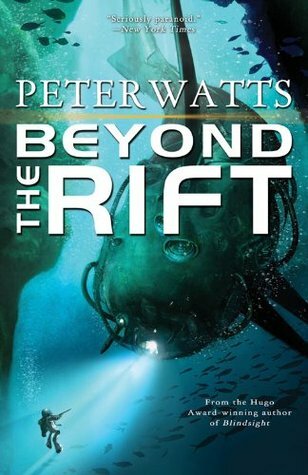 Watt’s writing is some of the most literary science fiction I have read, while also maintaining a strong undercurrent of ‘hard’ sci fi details. With so much sci fi being grounded in astronomy, it is nice to read these stories by someone with a background in biology and puts the focus on science and speculation from that point of view in particular. This point of view, coupled with his writing talent, allows Watts to excel at writing stories that feature the truly alien. This is no small thing, and actually rather unique amid the wealth of SF out there. So much SF contains aliens that are really easily recognized as human, or humanoid at least. Or they are described in terms of familiar creatures we know, like lizards or fish or bears. Most writers need this crutch to make the story and characters – even if alien – still relatable. Make them a little bit abnormal, or give them some familiar characteristic in extremis and go with it. Watts doesn’t settle for that. Most all of the stories in this collection feature alien life that is far more unique, bizarre, and unfamiliar than the norm. Using his command of realistic biological extrapolation he is able to describe things that are novel and foreign while allowing the reader to understand and still even sympathize at times with that alien Other. This skill is nicely made clear with the opening story, a take on the film “The Thing” told from the perspective of the alien. In each story that follows that alien perspective remains at the fore. In the afterward portion Watts discusses how his work is often described as dark, or horrifying, intense, disturbing, etc, and how these labels have some merit, but aren’t completely or singularly accurate. I think this label is attached to his writing not because of the overall plots or the tone of the stories, but the ease at which he writes that alien mind, mysterious and kind of unsettling in just how unrecognizable it is to our notions of culture, society, or biological behavior. The aliens are intelligent, but they don’t have a human-like civilization, making them more ‘animal’ and frightening to the reader than other common alien depictions. Despite the point of view of things alien, the stories ultimately lend one to consider what it is to be human, both in terms of biology and culture, and in that sense these stories are fantastic literature with a scientific bent. 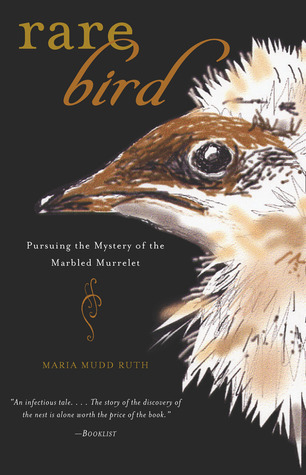 Ruth’s book chronicles the history of our discovery and understanding of this enigmatic Pacific coastal bird, the people involved in uncovering the data on its basic biology and behavior, and the threatened state the birds face on account of the direct and indirect influence of humanity. Throughout, Ruth chronicles her own burgeoning fascination with the elusive and unfamiliar bird. Although I found this book difficult to get into, it grew on me enormously as it continued, as I became more aware of exactly where Ruth was going in relating the story and what she was focusing on. As others here have mentioned, the book focuses far more on the details of human behavior than that of the birds, such as descriptions of what birders, biologists, rangers, etc, do to observe the birds, gather data, fight for their protection, or adversely impact the population. In this way the book is actually far more about people and their relation to the bird than the bird itself. Yes, the book covers bird behavior, particularly in terms of nesting and raising chicks. But still, these details flow from the focus on relating the tale of human discovery of the bird’s actual nesting and rearing behaviors. As I realized the book wasn’t going to be zeroed in on the birds quite as I expected, I found myself intrigued in the tales. The final chapters detailing the conundrums of modern conservation – regardless of what species one is talking about – or what habitat were the most intriguing and thought-provoking. Faced with our dependence on modern conveniences and the necessities of this world for sustaining the human population at its size – nevermind growing – it becomes easy to see how hard it is to champion conservation fully. Yet, when one considers what is at stake, honestly, it is a question worth seriously addressing. Overall the book ends up being inspirational as one realizes the boundless complexity of biology and its interaction with the environment that is exemplified in this bird’s story. Reading this affirms the beauty of life and the importance of its appreciation and study. Typically I do not enjoy warm-hearted, feel-good stories, but there are always exceptions that avoid becoming saccharine and remain sincere. 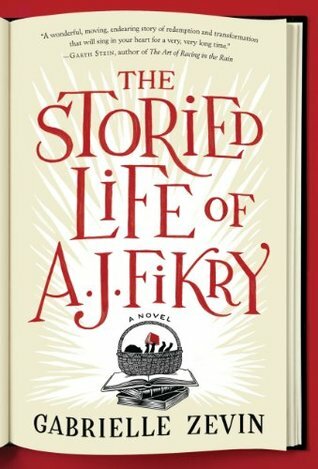 “The Storied Life of A.J. Fikry” is a novel that I rapidly fell in love with. The writing is not fancy, though filled with literary allusions, most basically in its structure with chapters named after key famous short stories. Between this construction and the overall plot, the novel is simply full of passion for all things bibliophilic. A key strength of the novel is in its eponymous protagonist, a persnickety bookseller who doesn’t get along well with most people and is in the midst of alcohol-infused mourning over the death of his wife. The growth of Fikry from this state to the ultimate person he becomes, mediated through the unexpected appearance of a baby girl in his life, is a pleasure to read, reminding one what can be good and beautiful about people and the power that literature can have over lives. While reading this (and several other things) I found myself most eager to return to these pages and these characters who even evoked several laughs and smirks as I got to know their quirks. I’m not at all surprised that Zevin has written children’s books, because this novel in a sense IS a children’s book: a simple story filled with joy and heart and wonder at life, a life filled with books, a life well-lived. There are aspects of “Snowblind” that make for fantastic horror. Chief among them is Golden’s talent for establishing mood, writing a novel that overall exudes creepiness, accentuating the horror that can easily greet those who step outside in the long dark of winter nights in the chilled air of falling snow. This kind of mood dominates the first portion of the novel, and Golden contrasts the chill of winter with a sort of general warmth and hopefulness in the air of relationships among his characters, a broad cast encompassing several townspeople. I enjoyed the first half of the novel and the slow building towards horror, a horror where the weather seems to take on a sinister life of its own. However, as with many horrors, the eventual reveal of its nature comes off as far less spooky than the mind may have imagined, and in this case, even a bit melodramatic, leading up to an ending that doesn’t fulfill that promise of the early pages. 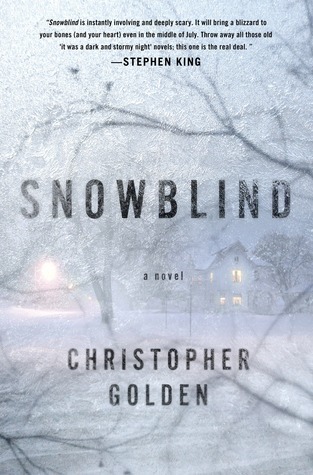 I know Golden has written media-tie-in stories, and that background shows strongly in the final pages of “Snowblind” where the plot becomes increasingly reminiscent of a network television show, with less darkness and horror and more feel-good wrap up of the more sympathetic characters. If you are a fan of horror, this could be a worthwhile winter’s night read that will heighten the affect of the novel’s pervasive mood. I imagine many readers won’t be as disappointed with the novel’s close as I, and I admit that even with that ultimate disappointment at the end that I did enjoy the overall creepy journey.